Bothered by bugs? Turn any patio umbrella into an instant screen house with the Outdoor Patio Umbrella Screen! Tell bugs to buzz off! 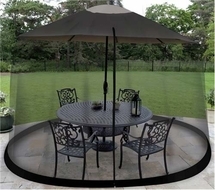 This Outdoor Umbrella Screen fits like a glove over patio umbrellas up to 9' in diam., creating a top-to-bottom, gazebo-style, micro-mesh barrier against annoying pests in just seconds. A clever drawstring top makes the height and diameter adjustable for a custom-fit look. Enjoy insect-free evenings for a fraction of what a patio addition or sun room would cost! Net gain: Deploys quickly and easily; Water-weighted ring at base helps create a firm seal; Large zippered entryway; Removes and stores easily when not in use. ; Order yours to protect against pests! Outdoor Patio Umbrella Screen.